It was a summer of higher expectations than ever before. People wondered if this year might be one that produced another film that clocked up the watershed number of 10 million admissions. This year, an impressive number of big-scale Korean films were making their debut, including Quick and Sector 7, produced by Haeundae director J.K. YOUN; The Front Line directed by JANG Hun, who had shot to stardom with popular films Rough Cut and Secret Union, and War of the Arrows (a.k.a. Arrow, The Ultimate Weapon) by KIM Han-min (Paradise Murdered, Handphone). It was definitely an unusual phenomenon for Korea to have four high-profile releases in one summer season, which provided even more reason to look forward to the fierce competition at the box office. people visit theatres in Korea. Summer vacation begins for students while adults plan for their annual getaways. This year, Quick and The Front Line both premiered during the third week of July. It’s unusual to see two domestic blockbusters debut during this prime season at the same time. Quick is about fast speed motorcycles, large-scale explosions and comedy, while The Front Line delves into the hidden side of the Korean War and its desperate combat scenes. The competitive energy between the two films was initiated when deciding on their release dates. Both were supposed to premiere on July 21, but The Front Line chose to pull is release forward by one day. Then Quick did the same. The race to occupy the market accelerated even more when both films held paid previews on the weekend prior to the original release date. It was a strategy to pad the official opening weekend’s box office tally. The Front Line won the first week with over 810,000 admissions. About 620,000 cinema-goers chose to see Quick. The Front Line continued its winning streak by a slim margin until Aug. 16. In the end, Quick recorded 3 million admissions, while The Front Line took 2.95 million. With budgets of KW8 billion (US$7 million) and KW10 billion (US$8.7 million) respectively, both films reached close to their break-even points. 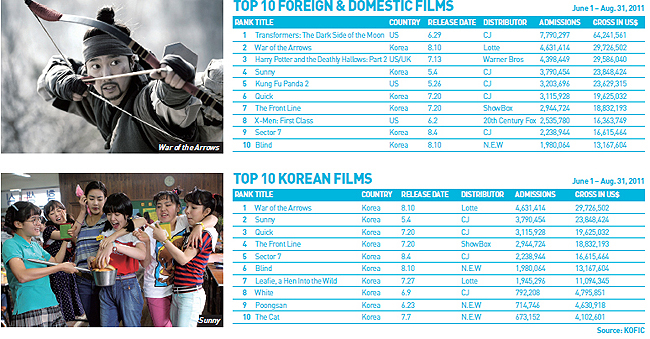 It turned out the two Korean films were not competing just between themselves. Big-budget sequels like Harry Potter and the Deathly Hallows – Part 2 and Transformers: Dark of the Moon were there to tackle them. July’s total admissions came to about 5.9 million, up 1.77 million from June, but 460,000 down from July 2010. Domestic film market share was at 32.4% - its lowest of the year. August was a month full of unexpected drama in the film market. Those working in the film industry as well as ordinary film-goers held the highest expectations for Sector 7. A monster film that relied purely on domestic technology, Sector 7 was also the first 3D film. But when it was revealed, critics were disappointed in its storytelling and how the 3D effects were used. Sector 7 still sold 1.35 million tickets within the first week - mainly a result of audience curiosity and underlying expectations. But in the following week, as soon as War of the Arrows hit screens, Sector 7 took a box office nosedive. War of the Arrows was not one of the most anticipated releases. Arrows had simple ambitions: to show arrow action. The film rests on a storyline as thin as that of Luc Besson’s Taken. A man jumps into a battle with a handful of arrows to rescue his sister. But the excitement that shoots out of his arrows is powerful. A favorable preview led to 1.74 million admissions in the first week. Arrows reached 4 million admissions after another 6 days. On Sept. 5, the film broke the 5 million admissions ceiling after placing no. 1 at the box office for four consecutive weeks. Film attendance grew at a rate twice as fast as that of the major sleeper hit Sunny, a nostalgic coming-of-age film. Sector 7 closed down after 2.25 million admissions. This year’s summer box office produced very honest results. Many ambitious films were backed with large investments, but cinema-goers chose to see films based on their cinematic strength. At the same time, other films like Blind and Leafie, a Hen into the Wild also created box office drama of their own. Blind is about a visually impaired woman who witnesses a murder and begins to track down the culprit. It was a film that was hidden behind the big-budget blockbusters. But after it was well-received by the press for the actors’ great performances and a tense storyline, more than 1 million people went to see the film in the first 8 days of its release. In 22 days, the film garnered 2 million admissions, well beyond the 1.4 million it needed to break even. Leafie, a Hen Into the Wild also attracted 2 million spectators, but the success of this animation film is more meaningful than that of Blind. Domestic animations have always faced difficulty at the box office in Korea. The previous best record was set by the digital restoration of Robot Taekwon V released in 2007, which sold 720,000 tickets. We can only talk of results, but the reasons for Leafie’s success can be seen in the solid storyline of the original book and the popular tones that were added in the adaptation process as well as the distribution capabilities of the conglomerate affiliate Lotte Entertainment. The success provided the Korean animation industry reason to regain its confidence, as it finally achieved – and surpassed - its long-cherished ambition of reaching 1 million admissions. The August domestic film market share reached 49.3%. This is a significant increase from last year’s 42%. The Korean film industry has probably realized fundamental truths more valuable than a film that hits 10 million admissions. People cannot be blinded with fast speed, extraordinary action scenes and 3D spectacle. And a film cannot succeed unless it holds onto essential cinematic values. In the end, the winner of the summer box office this year was the audience.